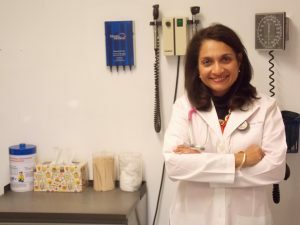 Dr. Rosemary Fernandez Stein is the owner and founder of IFC Pediatrics. A native of New York, Dr. Fernandez Stein completed her high school as an exchange student in Montreal, Canada where she became fluent in French. She attended medical school in the Dominican Republic, and completed her pediatric residency in New Jersey. Dr. Fernandez Stein was recognized in a national contest for pediatricians doing good deeds for the community in which she placed second. She is an Alamance Community College Trustee since 2008. Her focus is to increase the college graduation rates of Alamance students. “Dr. Rose”, as she is often called by her patients, is a staunch advocate for improving parenting across the nation. She speaks on several syndicated shows on the topic of parenting. Dr. Rose is available for group presentations and parenting lectures. Her recent book, Who Needs a Village? It’s a Mom Thing is available in paperback from Amazon.com.